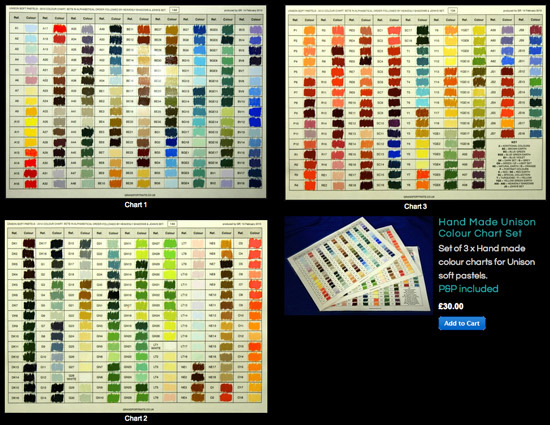 I came across an offer of three handmade laminated colour charts for Unison Pastels made by Unison Colour this morning. 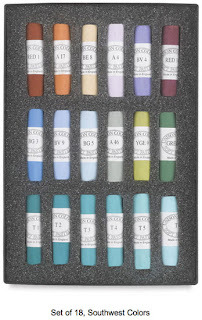 It struck me I'd never done a post about Unison Pastels colour charts - so here it is! 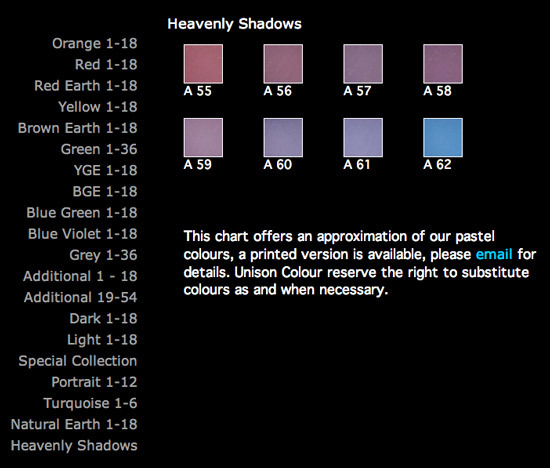 Colour charts are available in a number of different ways. See my Colour Theory for Artists site for the RGB (light) and CMYK (print) processes referenced above. Inevitably, a printed colour chart is easy to produce but does not always match up with real colour. This is one of the reasons why Old Holland Oil Colours have a hand painted colour strip on each tube of paint - so that the purchaser of an expensive paint can see the real colour when laid down. It's why some manufacturers produce hand-coloured paint charts. However when it comes to pastels there's a problem. A hand-coloured chart cannot be stored either by the retailer or the consumer as the pastel will be rubbed off. One pinned up in a studio will come to no harm - but these are probably best produced by the artist for the colour range they use. I never buy retailer's sets unless I can see the index number itemised for every colour in the set - on the basis I've probably already got them! 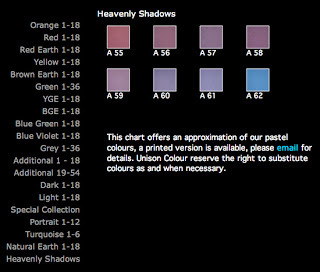 A couple of special selection sets are available via Jackson Art where they provide good images of the colours - but no listing as to the index numbers of the colours chosen. John's Set is apparently a set of the last colours that John Hersey made prior to his death. The Ann Oram Set of 30 Half Sticks is new and you can read about it here on the Jackson Arts Blog - New Ann Oram Unison Soft Pastels Set. Ann Oram taught a still life worksop at Unison's in Northumberland in 2012. Colour charts are available via photographs of the different sets in which the colour index number can be clearly seen. I'm not sure they have photographs for all the sets they retail. Jack Richeson has a printed color chart of all 402 colours (pdf file) that he stocks. He uses it to relate the Unison names for Colour Sets to the sets he stocks. On screen it looks like a pretty good match with the colours in the Unison sets. 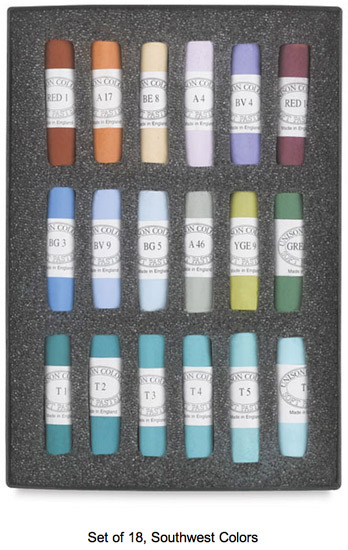 This morning I discovered the existence of the handmade laminated colour charts for Unison Pastels made by Glyn Rand. He emphasises that his product is neither affiliated to Unison Colour, nor is it endorsed by them. A handmade chart gets round the difficulties associated with the RGB/CMYK processes which have to translate colour in reality into another medium of vision or print. By completing the charts using the pastels and then laminating the charts, these should in theory be the best match with various Unison Pastels. The "But" is because my conclusion about this product is essentially "Nice idea, shame about the execution - and the price". the colour sets are spread across different columns. all the values are mixed up. If looking for a light tone and colour you can't scan the bottom of the chart and the light set - as the lights are all over the place. This would personally drive me absolutely potty and I couldn't look at them - I like my colours rigidly organised according to colour and tone because that allows me to work in an effective way. In fact every pastel artist I've ever known had all their pastels organised on two dimensions - by colour and tone. I can't think of any reason why any of them would want a colour chart which wasn't organised in the same way. Personally I think the price of £30 for the three charts is a bit steep when one considers that a laminating machine for A3 paper only costs around about £30 on Amazon! I don't think a product should ever prompt one to think about buying the kit required to produce the end product rather than the product itself!